Welcome today to Karen Bovenmyer as part of her blog tour for SWIFT FOR THE SUN. I love pirates and swashbuckling, smugglers and scoundrels. Errol Flynn, The Dread Pirate Roberts, Han Solo, even the Court Jester were staples of my childhood. So, when a friend mentioned a new LGBT romance press was looking for pirate stories, I jumped at the chance to get writing. This was about eight years ago. SWIFT FOR THE SUN had a long journey from inception to publication. The idea came easily and was as if I’d taken scissors and tape to my comic book collection: Han Solo and Tarzan fall in love and fight pirates. However, making that idea unfold on the page was a challenge from day one. I usually write science fiction and fantasy. This involves some research because there’s always a scientific or geological concept I need to understand for speculative stories, but I wasn’t at all prepared for the level of research I would need to do for SWIFT FOR THE SUN. The first draft took four months. While writing, I carefully read and re-read pirate and adventure stories to get a feel for the time period, including TREASURE ISLAND and legal documents and personal accounts about piracy. While my memory is a bit hazy, I’m reasonably sure I was doing way too much research and not writing enough, because the historical genre was new to me (though history was one of my undergraduate majors). I settled on the 1820s because I wanted the story to be after the Golden Age of Piracy. I didn’t want to glorify the atrocities pirates committed, so writing in a changing world of international politics and naval squadrons on patrol gave me more to work with in my plot. I chose the Caribbean because I had access through my university’s research library to more documents from Central America than I did from Polynesia, even though I was somewhat obsessed with CLOUD ATLAS at the time. It turns out there was a lot of action in the 1820s, including the violent and bloody formation of several sovereign nations of the Caribbean. Once I understood the political climate of the time period and narrowed down the month and year, the deeper machinations of the spies and revolutionaries, the plot wrote itself. Solid characters, a definite setting, and specific historical events were fun inspiration, after I’d gotten my footing. I finished the story, and it was barely over 20,000 words. I loved my smuggling scoundrel and my jungle man, the double-crossing pirates they fought against, and Dread Island, but it wasn’t a novel. It also wasn’t a romance. Though my characters did fall in love during the story, the focus was much more on their survival and the action of battling pirate ex-boyfriends than it was on their relationship. I had no idea where to send a novella of this length to sell it, or who would be interested in publishing it. So, I put it in a drawer for six years. After I got my MFA and regularly started publishing short fiction, I looked back into some of my old stories to see if there was anything I wanted to apply my new skills to and send out. I stumbled across SWIFT FOR THE SUN and got sucked in while re-reading it. I realized the characters were still solid and the story compelling. I still felt passionately about it. I looked up the press—Dreamspinner was now quite large and well established. I noticed they were selling some short fiction on their website, so I decided to take a chance and send them this story as a novella. They replied that the story I sent them was not a novel, nor was it a romance. But they loved my characters, setting, plot… they asked if I minded expanding the story to novel length. I still cared about Benjamin and Sun, and I wanted their story out there. So I agreed. My editor, Desi Chapman, sent me back my 20,000 words with detailed suggestions for places to expand. I had a three month deadline. I’ve never had more fun re-drafting. I read and re-read the manuscript and Desi’s comments to regain the feel, started reading fiction and non-fiction accounts of the 1820s to refresh my personal understanding of the time and linguistic conventions, and then starting expanding the draft, suggestion by suggestion. After a month and a half I had a novel-length manuscript, but I didn’t feel the story was “done.” Desi’s comments had enriched it so much, I had farther to go. My Han Solo character had changed into the over-his-head preacher’s son who is now my main character, Benjamin. Sun, my Tarzan, stayed roughly the same, but grew a better sense of humor. Miguel was added with all the complexities he represented, and Weasel’s a backstory expanded and intertwined to fit. The entire section on Tortuga was added. The draft grew large and complex, richer and even more exciting. I turned it in at around 70,000 words, just before my deadline. Over the next three months, the draft went back and forth between me and Desi, language experts checking the phrases I was using from five different languages, and another senior historical romance editor, and grew another 10,000 words as I filled in more about Benjamin and Sun’s relationship. At one point during this process, I traveled to a conference. 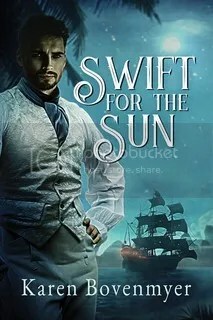 I was so in love with SWIFT FOR THE SUN I made arrangements that, should anything happen to me, a crew of six other MFAs who’d helped critique my draft would step in and make sure Benjamin and Sun got published. My family found this a bit morbid, but my writer friends completely understood. I’m proud to have my real name on SWIFT FOR THE SUN, though I considered a pseudonym because I usually publish science fiction and fantasy. I loved writing it, loved working with Dreamspinner to refine it into the story it is today, and hope people enjoy Benjamin and Sun’s adventure. With that loss, she realized becoming a published author had a nonnegotiable mortal time limit. She was accepted to the University of Southern Maine’s Stonecoast MFA program with a specialization in Popular Fiction and immediately started publishing, selling her first story just before starting the program and three more while in the extremely nurturing environment provided by the Stonecoast community, from which she graduated in 2013. Her science fiction, fantasy, and horror novellas, short stories, and poems now appear in more than forty publications including Abyss & Apex, Crossed Genres, Pseudopod, and Strange Horizons. She is the Horror Writers Association 2016 recipient of the Mary Wollstonecraft Shelley Scholarship. She serves as the nonfiction editor for Escape Artist’s Mothership Zeta Magazine and narrates stories for Pseudopod, Strange Horizons, Far Fetched Fables, Star Ship Sofa, and the Gallery of Curiosities Podcasts. Her first novel, SWIFT FOR THE SUN, an LGBT pirate romantic adventure set in the 1820s Caribbean, will be published on March 27, 2017.